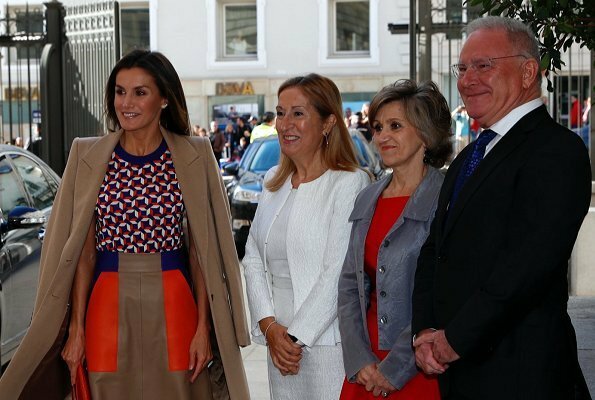 On October 9, 2018, Queen Letizia of Spain attended the opening of World Mental Health Day 2018 Congress held by Confederación Salud Mental España at the Congress of Deputies (Congreso de los Diputados) in Madrid. The theme of this year’s World Mental Health Congress is Inclusive education, positive mental health. That's exactly what I was thinking of ! Like everything except the skirt. 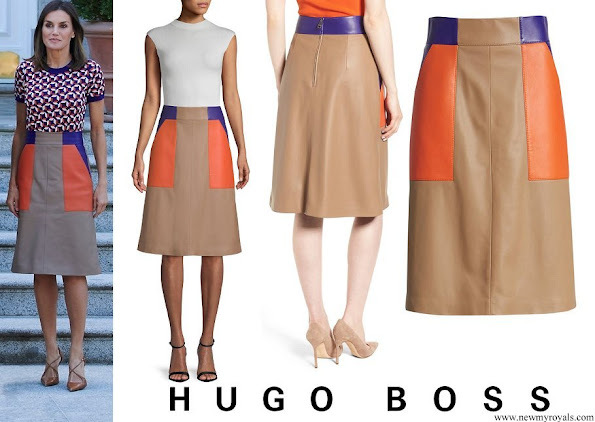 Would prefer a solid skirt in the blue/purple color. 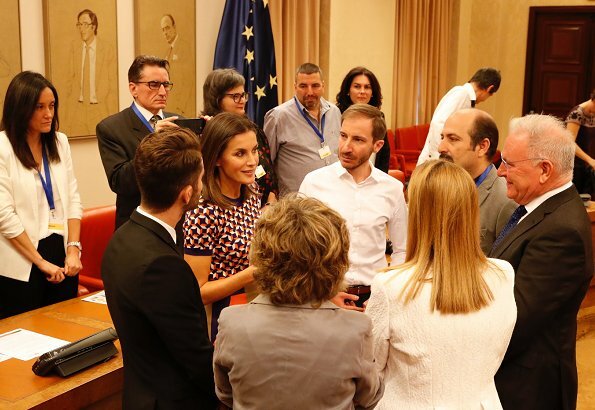 Letizia, busy as usual with worthy organizations and causes. bravo! 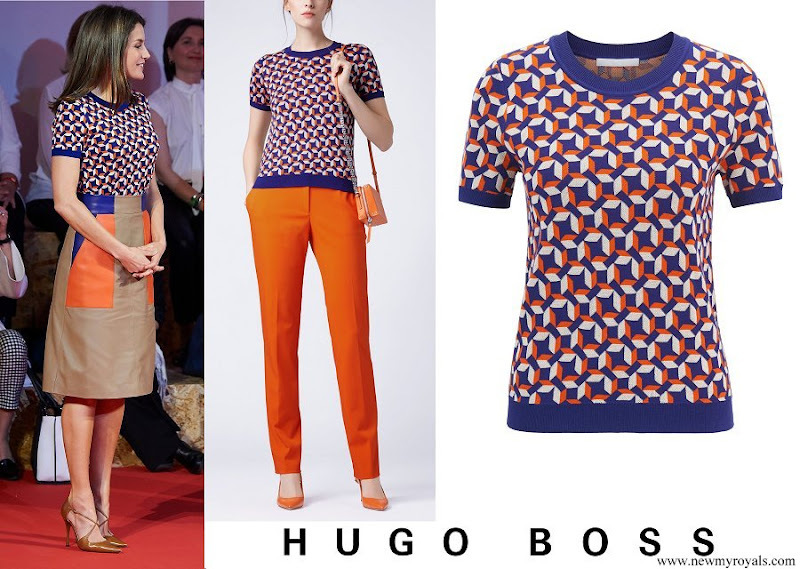 I think the model looks much elegant than Queen Letizia. Today's World Mental Health Day 2018 is a very important event. Like the coat shoes and bag,do not care for the skirt and top. She must like it or she would not wear it. And that is fine with me. For a royal who always makes such good fashion choices, this is a surprise. I only like the shoes. Sorry to say that. Not her best choice. The skirt looks wrinkled although it may be because of the type of material, I don't care for her make up or hair either. She can do better. ¡Me encanta este conjunto, tan moderno y atrevido! El contrapunto lo ponen el bonito abrigo clásico y los estupendos zapatos. 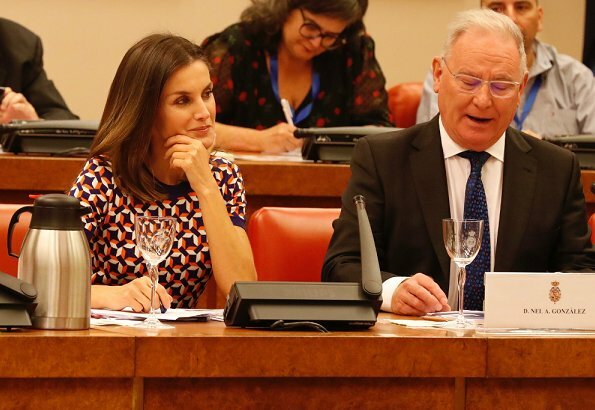 Letizia se ve genial. I will keep the coat and the shoes, don't care about the skirt. It is true that this outfit will not please everyone. Some people are uncomfortable when away from primary colors and there is nothing wrong with that. This was intended to appeal to people who can look at a pantone seasonal color story and are able to mix colors, textures and prints to create a result that is unusual, and sophisticated. The coat was the perfect complement. This could easily have been created by Agatha RdP. Another way of looking at fashion. Anonymous @2:27, love your perspective on fashion. This outfit is not for everybody, but for me is just WOW!! @CherryB. The thing about prints is that we all belonged a tribe somewhere back in the past, and each tribe created patterns that were original to them. They have now been modified or adapted by today's designers. There are Plaids, Southwest, Aztec, Andean, Sami, African to list a few that are full of rich bright colors and shapes. If there was no clothing people painted or carved patterns on their bodies. Prints are everywhere in nature if you care to look. Brightly colored snakes and butterflies for example. Again this particular design is not for everyone, but the reaction of some is really a little gauche. Ich ziehe immer den Hut vor all jenen royalen Damen, die etwas wagen, die mit der Mode spielen. Nicht immer natürlich, da steht der Job und das Protokoll im Wege, aber hin und wieder, warum nicht? Somit mag ich auch die Wahl der spanischen Königin, die sich an einen 'gewagten' Mustermix herantraut. Zusammen mit dem klassischen Mantel und den wunderbaren Schuhen ist es OK.